A very very very rare wallpaper by me. So why this wallpaper.. Just because I was on Miyavi's concert in Vienna and it was great. 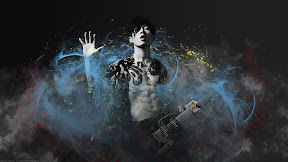 While I was working on my new Orion wallpaper (will be soon available) I did listen to Miyavi's songs and after I did finished that wallpaper I was like "hmm.. maybe she* will like a wallpaper with Miyavi".